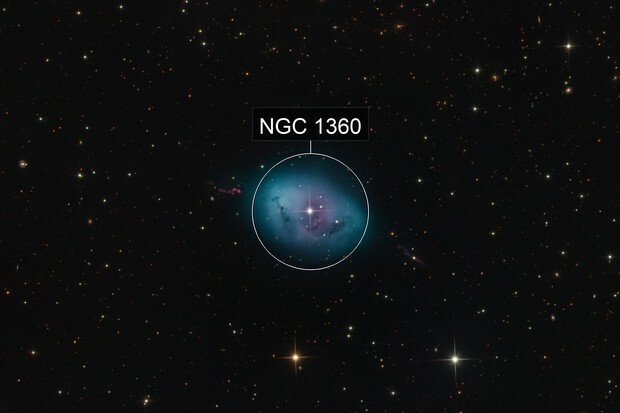 This is an example of a typical evolved planetary nebula. In other words, aging. It lacks the obvious shell morphology often seen in a younger versions of planetary nebula. This large beautiful planetary nebula can be found in the constellation Fornax. Its common name, “The Robin’s Egg Nebula” describes the object perfectly. Reddish jet like glows located along the longer axis are believed to have been ejected from the original star before its final collapse. In time, entropy will cause everything to fade. Eventually, only the white dwarf in the centre will remain. It will take several billion years to finally cool off. I really wanted to show as many details and features that I could with this data set. Accentuating depth and contrast areas within this very distinctive object. The image was constructed using five filters, Luminance, Red, Green, Blue, and Hydrogen-Alpha (Ha). The total imaging time is 65.75 hours.